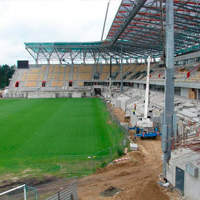 July 1 – this is when two stands of the new Stadion Miejski in Bialystok were to be delivered and transferred to the municipality. It didn't happen. “We should be taking over at the stadium on Monday. Yet we have no signal from the contractors that their work is done”, says Adam Popławski, chairman of purpose-established public company Stadion Miejski, acting as investor and later operator of the ground. Today was already the 3rd deadline Spanish developer OHL were given. Earlier they were to deliver two first stands of the stadium in February and then in May 2013. Both deadlines were passed without consequences as the municipality of Białystok accepted OHL's justification that their investment partner Hydrobudowa went bust. This may have delayed the process for a few months, indeed. However, now authorities say their patience is up and starting today penalties will be charged for every day behind schedule.